On January 17th, 2017, Nate Sickler was appointed as the Sheriff of Jackson County, Oregon, by the Jackson County Board of Commissioners. He had been serving as the deputy chief of the sheriff’s office since December 30th of 2016. 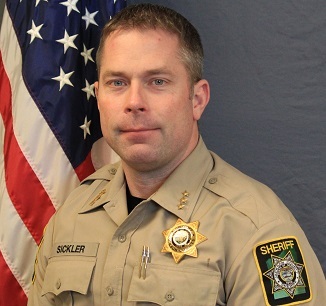 Sheriff Sickler began a career in law enforcement in 1998 as a reserve police officer, while he finished his education at Southern Oregon University. In 1999, he obtained a Bachelor’s Degree in Criminology and was hired full-time as a police officer for the City of Phoenix, Oregon. He worked there until taking a job with the City of Klamath Falls Police Department in 2002. As a city police officer, Sickler served as a patrol corporal, a SWAT team member, a drug recognition evaluator (D.R.E.) and a firearms instructor. In 2006, Sheriff Sickler had an opportunity to come to the Jackson County Sheriff’s Office and begin his career as a deputy. He was promoted in 2008 to Sergeant, and worked as a patrol sergeant until October of 2012, when he moved to the Criminal Investigations Division. In March of 2015 he took a position as an interim captain, and in July of 2015 he was promoted to Captain. As a sheriff’s deputy, Sheriff Sickler served on the department’s SWAT team and in the training unit as a Firearms and Active Shooter instructor. He also served as a department association representative, a D.R.E. and a D.R.E. instructor for 4 years. Sheriff Sickler enjoys time with his friends and family and would like to recognize his wife DeAnna, who has supported him throughout a busy but rewarding career.